Adam Warrington won the men's two-bowl singles. 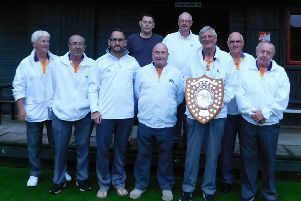 Northants bowlers completed a hat-trick of national titles and narrowly missed out on a fourth at the English Bowling Federation Championships at Skegness. Helen Holroyd, who plays at both the Stamford and Blackstones clubs, produced devastating performances to win the women’s under 25 singles, conceding just 28 shots in four matches, including a 21-8 victory in the final against Derbyshire’s Eloise Collins. The Parkway trio of Paul Dalliday, Simon Law and Tristan Morton were comfortable winners of the two-bowl rinks, beating Cleveland 21-12, Humberside 23-11 and Hunts 22-11 in the final, Morton missing the semi-final owing to commitments at the Bowls England championships in Leamington, but returned for the final to replace his substitute James Harford. 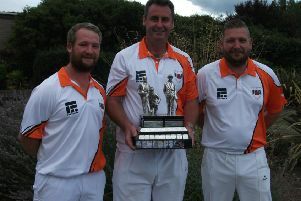 Adam Warrington (Blackstones) won the men’s two-bowl singles for the third time, but never had to deliver a bowl in the final, his opponent from Lincolnshire, Andy Bird, being forced to concede because of weekend family commitments in Holland. While it was a something of a hollow victory in the end, Warrington was impressive in his wins over John Ivatt (North Cambs) 21-10, Chris Hanslip (Humberside) 21-11 and Jack Emmerson (Notts) 21-19. Bob Warters (Ketton) narrowly missed out winning the men’s veterans singles for the second time in three years, losing 21-19 in the final to Suffolk’s Paul Cook having led 9-3 and 17-16. For good measure, Graham Agger (Whittlesey Manor) and Yaxley pair Doris Flowers and Joan Padley won the non-championship open triples tournament.